It was the time for the morning prayer at the fifth annual international conference of Sisters of Earth in Holyoke, Massachusetts (2002). The 150 sisters gathered in two concentric circles before a multi-level altar constructed to honor the “Great Mystery” at the heart of the universe. The nuns paid homage to the four elements on one end of the altar – earth, air, water and fire. 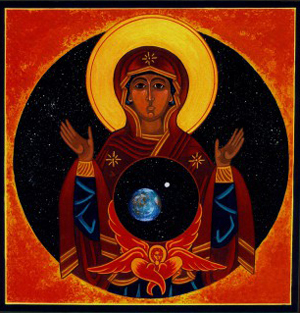 On the other end was an icon called the Mary of the Cosmos, an image of the Virgin bearing the cosmos inside her womb. It is certainly a far cry from morning Prime prayers of the pre-Vatican II nuns, which was turned primarily toward adoring God. This new “liturgy” is turned toward worshipping Earth, considered as a living entity, and acknowledging the “God within” each sister. 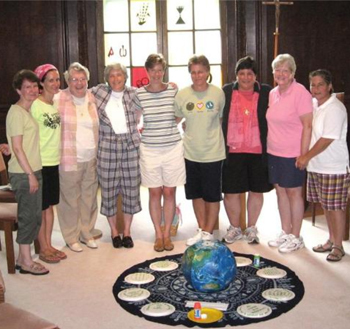 Supported by the Leadership Conference of Women Religious (LCWR), Sisters of Earth is one of a whole decentralized network of Catholic religious communities that is committed to a new religiosity called the “Great Work.” This is, simply put, a radical change in every aspect of human society – political, social and religious. The nuns who have embraced this new eco-spirituality have taken up this “Great Work,” which they see as larger than the Church herself. IHS sisters honoring the Earth in a prayer ritual"
An ever-growing number of religious communities – old and new – have focused their missions on environmental concerns and ecological activism. It is a decentralized network – on the internet one can find partial listings of ecological centers and initiatives founded or directed by US Catholic nuns. The number is constantly growing. Their “earth ministries” also have many forms. Some create community-supported organic gardens, in which they engage in "sacred agriculture" and "contemplative gardening." Many host meditation and healing retreats; others engage in environmental activist programs. Most develop "green" liturgies and "green" prayers. All cultivate green habits in their everyday diet, dress, housekeeping, use of energy, and so forth. Underlying these works is a philosophy based on evolution and theological pluralism. Along the way they inevitably go into Pantheism. Among the so-called Green Sisters, we find leaders like Sister Miriam Therese MacGillis, a Dominican who promotes goddess-worship and “eco-spirituality” in speaking tours around the world and founder of Genesis Farm. Or Sisters of Earth founder Mary Southard, a Sister of St. Joseph artist whose work reflects the radical shift taking place in human consciousness away from man-centeredness and toward Earth-centeredness. Or Sister Virginia Froehle, a Sister of Mercy who penned the book Called into Her Presence: Praying with Feminine Images of God. But their mentor, the prophet of eco-spirituality, is a man – the Passionist priest, Fr. Thomas Berry (1914-2009), who called himself an ecologian rather than a theologian because he believed the focus shifted from the study of God to that of earth and man. In turn, Berry’s thinking was inspired by Jesuit Pierre Teilhard de Chardin, and he served as president of the American Teilhard Association. Berry adopted the evolutionary history of Chardin, but, based on his studies in China, he gave to Teilhard a more Eastern focus. He found wisdom and the divine in all the major religions - Hinduism, Buddhism, Taoism, Zen, and especially Confucianism, which he considered to have a more harmonious understanding of the cosmic and human orders than Catholicism. In developing his thinking on the spirituality of Earth, he also drew on the rituals and symbols of Native American religions. To steer the direction of the future Berry developed the New Story, which you find behind all the developing American eco-spiritual movements. According to it, in the evolutionary process we are moving toward a new ‘Moment of Grace’, a new cosmic phase. He considers that these religious communities of nuns are helping this new stage of man emerge: he becomes aware of a collective consciousness and enters into “communion” with the Earth. Noteworthy is the fact that Fr. Berry – unlike his mentor Teilhard de Chardin – was never disciplined by the Vatican and, until his death in 2009, remained a priest in good standing. One of the key building blocks to transition to this new cosmic age is Berry’s New Story. The old creation story – based on Genesis – no longer suffices for modern man, he asserts. It is man-centered and its focus on a God who created the world under the dominium of man is outdated. The New Story is a "narrative" of a cosmic evolution, and is the “scientific“ story of the evolutionary development of the universe from its beginnings to the present. We have reached, he affirms, an important new phase based on the understanding of ourselves, the earth and the cosmos. He also calls it the Universe Story, or Epic of Evolution, the Sacred Evolutionary Unfolding of Creation. Here is basically what supposedly happened. An original fireball contained all that exists today, the source of all, coming from the heart of the Divine Mystery. Some 15 billion years ago, an explosion shaped the universe that is now expanding. One hundred billion galaxies resulted from that explosion. The Creator Spirit is present in the Universe, guiding the ongoing evolutionary process from within. And so he travels through the various great transitions in the evolutionary process, from the Roman world to the medieval era, from the medieval to modern times. And now, according to Berry and Teilhard de Chardin, we have reached the greatest transition in man’s supposed 67 million year history. We are arriving at a stage that involves a new human consciousness of man and earth, a new dimension of human existence. In it, as man becomes aware of the human and non-human interconnection, he enters into communion with the Creative Force and can make the “evolutionary leap” to a self-divinization. Thus the importance of the telling of the New Story of an evolving universe - which does away with Genesis. The telling leads to development of self-reflective consciousness and collective learning, which opens the door for the beginning of that Ecozoic Age (which Teilhard called the Christogenesis). 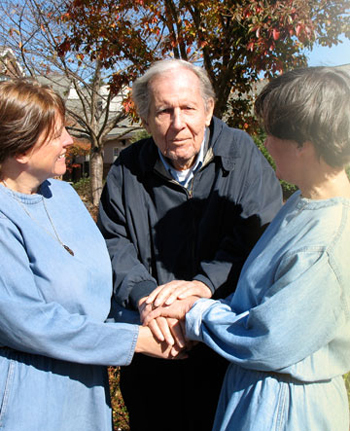 A good example of how the “New Story” is being told is the Cosmic Walk, invented by Sister Miriam MacGillis and used in eco-spiritual retreats by sisters throughout the country today. 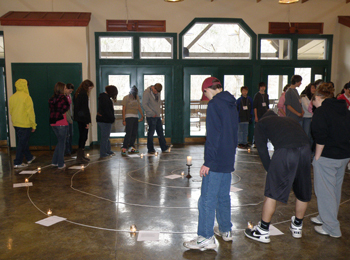 The Cosmic Walk is a symbolic re-enactment of the New Story that allows participants to enter personally into the story. A long rope is placed in a spiral, with 30 index cards representing the stages of evolution. Standing at the place of the first "Flaring Forth," the "pilgrims" are to reflect that they too are 15 billion years old. Likewise, they are invited to “enter” each great transition period in evolutionary history. At the end of the story when persons come out of the spiral, they call out their names: "The Universe has become Mary!" "The Universe has become James!"